The caravan aims to address the key issues of climate change, gender and food sovereignty and their interrelationships. There is an ongoing and urgent need to inform and mobilize vulnerable peasant populations in order to respond to the threats of climate change, and to further develop international solidarity networks concerning climate change and food sovereignty. Friends of Bangladesh was formed by Australian participants of the 2011 Climate Caravan across Bangladesh, a transformative and eye opening experience for many of the participants. 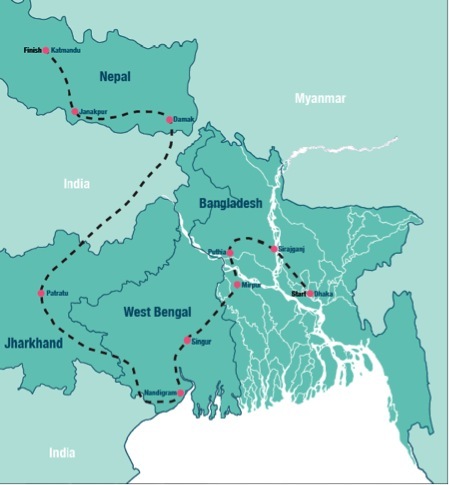 The 2014 Caravan which will be traveling through Bangladesh, India and Nepal over 18 days. It is a great opportunity to learn, share, participate, increase solidarity networks and strengthen local movements in the global struggle for food sovereignty, climate and gender justice. 10th to the 28th of November. Please see the very detailed PDF Here for full information on the caravan. If you require more details please email us at friendsofbangladesh@hushmail.com or fill in the Registration Form and we will be in contact. Do you still need participants?. When is this being held?